I decided that if I had to remake it, it needed to be as different as possible from my original, otherwise, where's the challenge, right? So, instead of lots of white space, I made a card with lots of black space!! I spent the most time trying to figure out what 3 things to use on this card. I was going to make 3 people using my Cricut Paper Dolls cartridge, but do you realize how many little pieces you need to cut out to make just one person? Definitely not simple!! I did notice that there are little extras that go with each person on the cartridge and there was this adorable little frog that jumped out at me (ha!) from the instruction manual. He goes with the witch on the cartridge. I cut three of them out of A muse's green gingham. 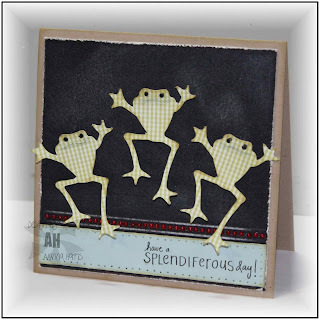 For my black layer, I pulled out some A muse shimmer paper, knowing that it has a white core...perfect for distressing. 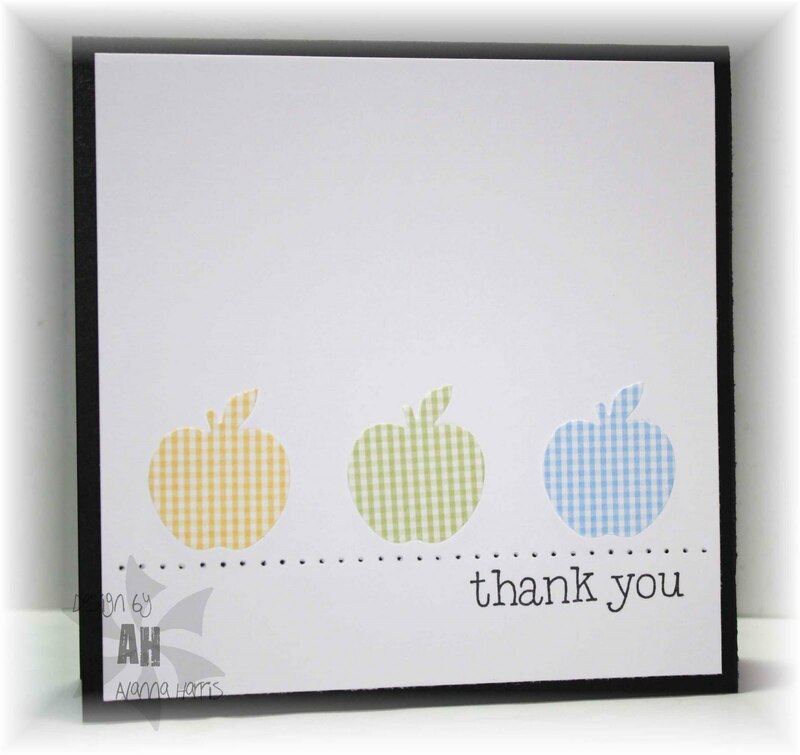 I wanted this card to be rough and distressed..the anti-gingham apples! The black layer was scored at the bottom, sanded and edge-distressed, then glued onto a kraft base. I inked the edges of the frogs and popped them up all jumpy on the black layer. I added a strip of my much loved but retired SU soft sky for the sentiment, again distressed and pierced. I thought I was done. I stared at my card. It needed something. I added some tiny bling for the frog's eyes. Still not perfect. I coloured the bling black with a copic marker. Still not perfect. It seemed like some colour was needed...I splurged and added an entire strip of tiny red pearls. between the score lines. DONE!!! 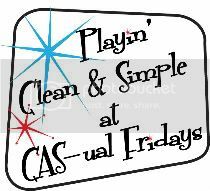 It is certainly not as simple as the first one...and I'm not sure I can say it's "clean" with all the distressing I did, but the design is still clean, right?! Thanks for stopping by...please go and create something...I want to see what you do to my Gingham Apples! !